Zion National Park is located in southwestern Utah, along the western margin of the Colorado Plateau. The park was established in 1919, after roadway improvements in southwestern Utah allowed access to the preceding Mukuntuweap National Monument (1909), located in Zion Canyon. The towering cliffs bounding the North Fork of the Virgin River are formed mainly of tan to light pink Navajo Sandstone, the remains of a sand dune sea that covered the area during the early Mesozoic Era, nearly 200 million years ago. At that point in its history, the Zion region would have looked much like the present-day Sahara Desert. Younger, brown rock that caps the Navajo Sandstone (image right) records how the environment fluctuated between shallow seas and deserts. 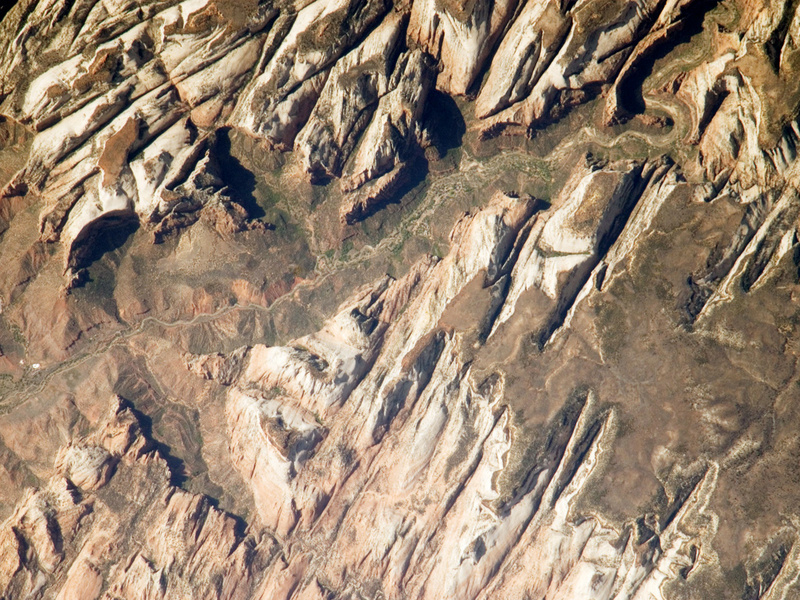 This high-resolution astronaut photograph illustrates the incised nature of the bedrock in the park. 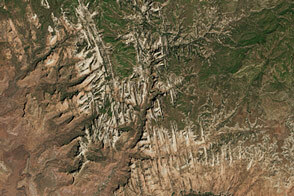 The long linear features are fractures in the rock—joints—caused by tectonic stresses. 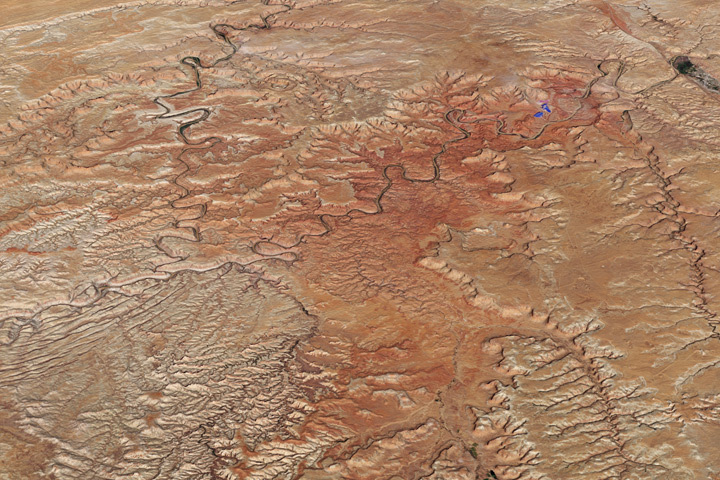 The mainly north-northwest trending joints channel water runoff, and they appear to be the main factor that determined the present canyon network. While the park is perhaps best experienced by hiking, backpacking, or biking, Utah State Route 9 (SR-9) provides automobile access up the side of Zion Canyon. 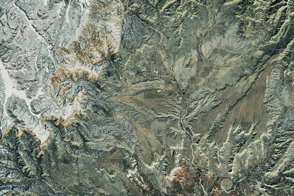 The road is visible in the astronaut photograph as a thin brown line climbing the south wall of the canyon (lower left; more obvious in the large image). Access to the rest of the park is provided by a shuttle bus system instituted in 2000 to reduce vehicle noise, improve air quality, and improve wildlife habitat. Astronaut photograph ISS017-E-5351 was acquired on April 26, 2008, with a Nikon D2Xs digital camera fitted with an 800 mm lens, and is provided by the ISS Crew Earth Observations experiment. The image was taken by the Expedition 17 crew, and is provided by the Image Science & Analysis Laboratory, Johnson Space Center. The image in this article has been cropped and enhanced to improve contrast. Lens artifacts have been removed. The International Space Station Program supports the laboratory to help astronauts take pictures of Earth that will be of the greatest value to scientists and the public, and to make those images freely available on the Internet. Additional images taken by astronauts and cosmonauts can be viewed at the NASA/JSC Gateway to Astronaut Photography of Earth. Caption by William L. Stefanov, NASA-JSC. Located in southwestern Utah along the western margin of the Colorado Plateau, the park was established in 1919 after roadway improvements allowed access to the Mukuntuweap National Monument. Biek, R.F., Willis, G.C., Hylland, M.D., and Doelling, H.H. (2000). Geology of Zion National Park, Utah. D.A. Sprinkel, T.C. Chidsey Jr., and P.B. Anderson (Eds. 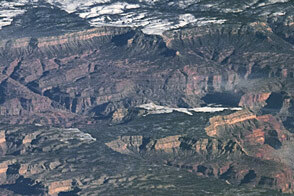 ), Geology of Utah’s Parks and Monuments, Utah Geological Association Publication 28, pp.107-138. Salt Lake City: Utah Geological Association.